Last year we saw some important trends in the economy: a decline in the dollar index, the market breaking records, and an increase in the price of oil. Not to mention, the Fed finally began its quantitative tightening plans. As we look forward into the New Year of 2018, it’s important to look back at these financial trends to see how they might affect us during the next 12 months. If the last year was anything to go by, investors may be asking themselves some important questions. 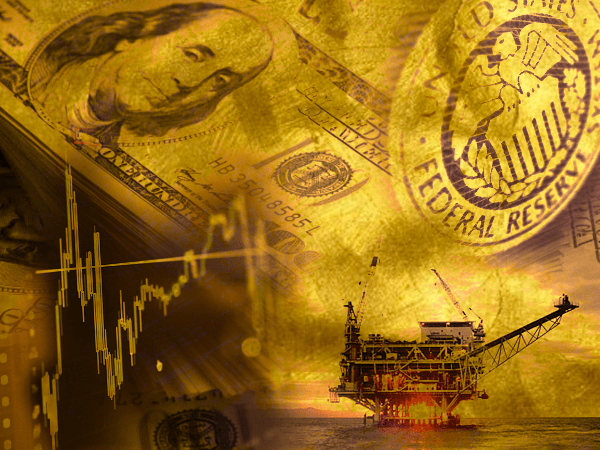 Will we see further increases in oil prices? Will the bull market continue its record streak? Will the Fed’s quantitative tightening be a catalyst for the next recession? And what could all this mean for the price of gold? Here are a few predictions based on what we saw and what we know right now. In 2017 the dollar dropped by 9.9%, its worst performance in 14 years. Despite the Fed hiking interest rates three times, and record highs in the stock market, the dollar had a tough time competing on the global stage. With the world economy growing, other currencies have started to leave it behind, such as the euro which soared more than 14% last year. And while there are three more hikes from the Fed on the horizon for 2018, and new tax cuts meant to stimulate the economy, analysts aren’t feeling optimistic. Most analysts predict a similarly tough year for the greenback in 2018. Goldman Sachs expects a “soggy dollar,” meaning a dollar that has “all but finished pricing the relative strength of the US vs. the global economy.” UBS and Lombard Odier expect the euro to keep gaining against the dollar, while strategists at French Bank Société Générale see the dollar falling another 10%, first against the euro then against the yen. A weaker dollar ultimately means higher prices, especially for gold and imported goods. As reported back in November, Aramco, Saudi Arabia’s state-owned petroleum and natural gas company, has still yet to decide which stock market they want to enter. This means they’ll likely continue their restrictions on production in order to increase the price of oil and ultimately enhance their IPO value. Oil prices started the year off at $60 a barrel, the highest since 2014. And with the major producers halting production to brace themselves for Aramco’s arrival on the stock market, the price of crude looks set to soar even higher in 2018. The likely scenario for 2018 is a continuation of the tightening that has been underway for the past six months. As the market continues to tighten, prices will continue to rise, but the fear cycle will gradually become more prominent. This once again increases the risk of oil price spikes based on geopolitical events in oil-producing regions. The only real threats to this scenario are OPEC having the ability to – and deciding to – once again flood the market. This is unlikely given the steep price they paid for taking this action in 2014. Alternatively, a global recession is the only other likely candidate for curbing oil prices. Otherwise, $70/bbl or more looks likely in 2018. Since WW2 the U.S. has witnessed eleven economic recessions. During this time economists have noticed an interesting trend: all those past recessions, except for one in 1960, were preceded by an increase in the price of oil. It’s for this reason that an increase in oil price is often viewed by many economists as a reliable indicator that a recession is on the way. Fueled by economic growth both at home and abroad, corporate tax cuts, and strong corporate profits, 2017 witnessed the continuation of the second-longest bull market since World War II. The Dow Jones Industrial Average, S&P 500 and Nasdaq Composite all ended the year with their best performances since 2013. The U.S. economy is in the late stages of a longer-than-expected expansion and remains mired in subpar growth. Meanwhile, both the stock and bond markets—because of their frothy prices and outsize gains in recent years—are expected to deliver below-average gains over the coming decade. Above-average gains, by definition, are not sustainable long-term, which is why many experts are predicting a regression to the mean. In other words, the stock market could soon cool off and even decline for a period of time. Since it began its quantitative easing back in 2008, the Fed’s large scale purchases of U.S. treasuries and government-supported mortgage-backed securities has swollen its balance sheet to $4.5 trillion. It’s remained at this figure since Fed Chair Janet Yellen announced the end of the bond-buying program in 2014. However, the unwinding process will have consequences. This is summed up by the inverted yield curve, which is a clear sign that a recession is on the way. 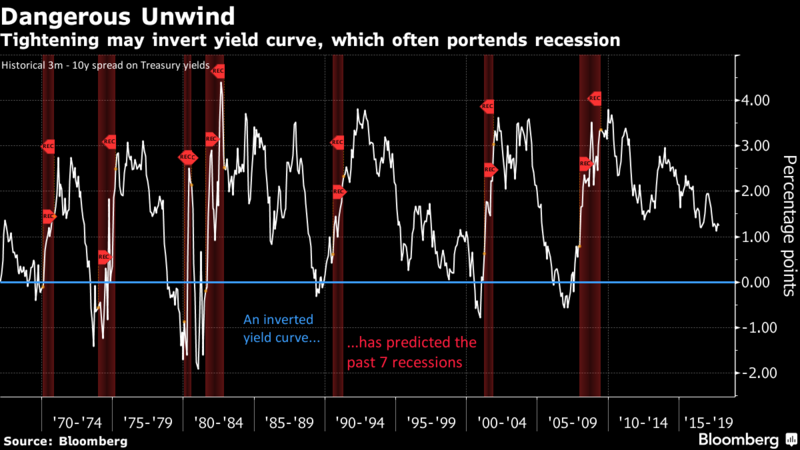 An inverted yield curve is another foolproof recession signal. The yield curve is simply a plot of interest rates on the vertical axis and term length on the horizontal. If short-term interest rates are higher than long-term rates, the curve is inverted. Since there is more risk in longer-term loans, the only explanation for an inverted yield curve is that lenders expect lower average inflation in the longer-run and the reason they think that is they are anticipating economic weakness–a recession. The Federal Reserve is going to keep raising short-term rates (which they have more control over) in 2018 and if those short-term rates go above longer-term ones, prepare your portfolio and personal finances for a recession. As the following graph shows, an inverted yield curve preceded the last 7 recessions. Will Any of These Predictions Affect Gold? If these predictions come true, they are all expected to positively impact the price of gold. As discussed earlier this week, the falling dollar means gold is on its way to its best year since 2010. This, together with Aramco going public, investors set to hoard their profits when the bull market slows down, and a recession around the corner mean gold prices in 2018 can only go one way: up.